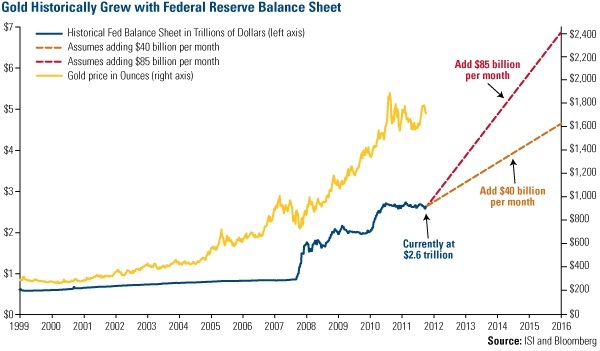 Since 1999 the gold price has moved in concert with the growth in the US Federal Reserve Balance Sheet…including the recent correction in both during the past three years. Accordingly, the following objective analysis will forecast the gold price out to 2016…based solely on historical Central Bank data. Moreover, it’s noteworthy that the Balance Sheets of major international central banks have likewise been growing in tandem since the beginning of the millennium. The chart below clearly shows steady Balance Sheet increases in the Euro Central Bank, Bank of Japan, Bank of England and the US Federal Reserve. This entry was posted in news and tagged deflation, dollar collapse, economic collapse, Economic Crisis, Fed, fed policy, federal reserve, Financial Crisis, Gold, gold manipulation, inflation, palladium, platinum, PMC Ounce, precious metals, silver, US Dollar on November 17, 2014 by Site Admin.